Since what you are about to see is all about quilt backs being fun, I couldn't think of a better place to meet than the back porch to discuss this. So....here we are. Grab a step or a chair and let's talk about how much fun making a back can be! Piece a back of a quilt? Are you out of your mind? It took me forever to piece the front, why in the world would I want to do the same on the back? It’s going to be on the bed, or it’s going to hang on the wall…….who in the world is going to see it? It’s over, I’m done! Sound familiar? I suppose everyone has thought that. 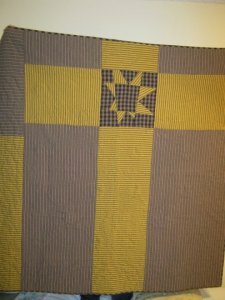 And, I can’t say that I blame you, but I’m here to tell you that piecing the back is fun and something you should reconsider! For instance, if it’s on the YOUR bed, who is the one crawling under it? You! Shouldn’t you be able to see the back and smile? 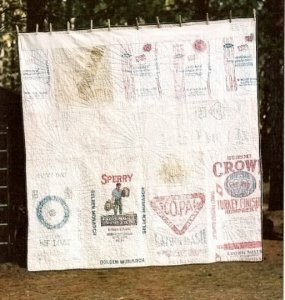 I must admit that when I first started out, the backs of my quilts were either done in muslin (why? 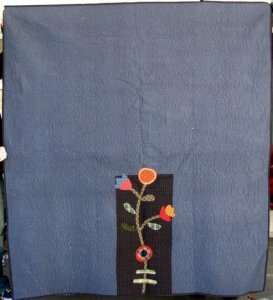 Because it was easy to hand quilt through, it always helped to make the stitches very tiny because it is so thin) or the back was just one print of perhaps something fun that would go with the name of the quilt. 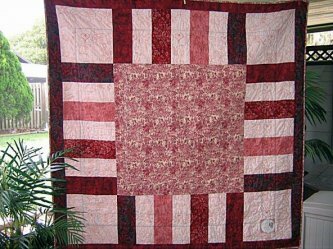 For instance, if it was a Christmas quilt, then perhaps I’d use a print with a Christmas theme. 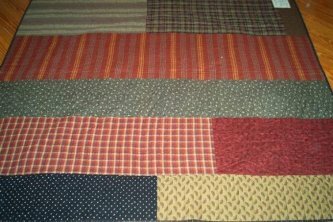 And, I really liked to see a small calico print on the backs of my quilts that would go with all the plaids on the front and many have just that. Is there anything wrong with any of those ideas? Not at all. 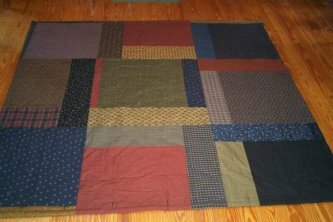 But, then I found that by piecing the back, I didn’t have to worry about having to try to find enough of one particular fabric for the entire thing. Have you ever gone to the store to get the perfect fabric and find that there isn’t enough on the bolt? 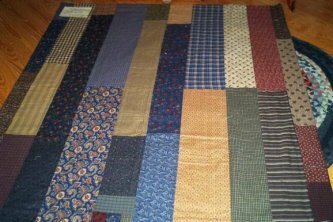 7 to 10 yards is a lot of fabric for a large quilt. I say, YEAH! It makes you think outside of the box. Gramma wouldn’t have had enough of one particular fabric. My Gramma used to use sugar sacks, cotton feed sacks or whatever she could find. And, some of those items also made bloomers for all the girls. 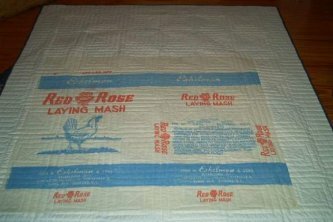 Mom says she had “red rose” printed across her bottom many times from those sacks. 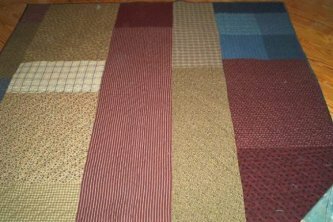 An antique friend of mine found an old feed sack coverlet and thought of me. 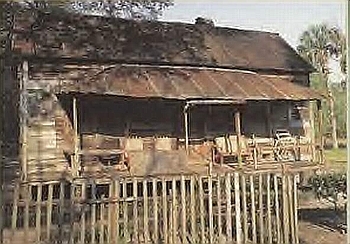 It was just like it sounds, several cotton feed sacks sewn together. Some of the lettering was still there and almost thread bare. I think there are a couple of interesting holes in it too that I just left. When I put this on the back of Wild Things, I actually put all the seams so they show on the outside. 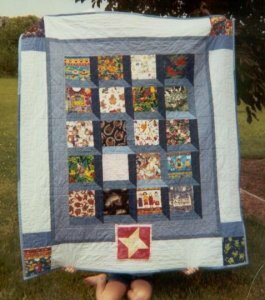 When you see this quilt at your local shop in a trunk show, ask them to show you the back. It’s very different and a lot of fun! 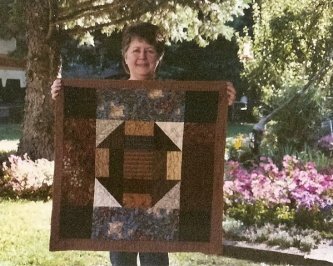 I made a quilt once that the entire quilt was a big pieced star. I love that quilt. On the back I pieced several of the colors on the front and then thought, well, why not put a row of appliquéd flowers on the back! No one sees that but me, and I consider it my privilege to show that to others if I choose to do so! When I made A Tisket A Tasket I had some of the flowers left over that I didn’t use on the front……..yep, they are on the back! 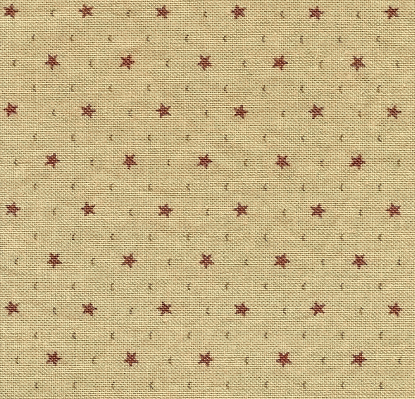 By the way, did you ever find Barnabus on the cover of your pattern? Hmmm, perhaps you should look on the back of the quilt? 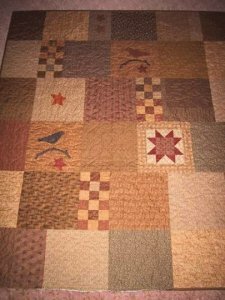 My Prairie Christmas Star is a 30-block quilt and trust me when I say, I was really over that one. 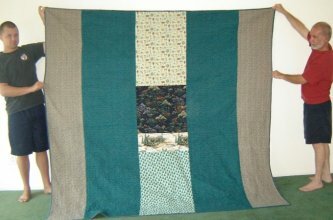 Oh, I’m so glad I made all 30 blocks, but it made the quilt quite large. Matter of fact, to fit my bed downstairs I could roll the top down. So, if it was going to be rolled down, it needed something fun on the back. I made large sawteeth on the back on just that side. It makes me smile when I look at it. 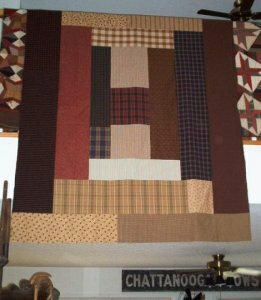 Many of my quilts have giant blocks sewn together making what looks like a checkerboard. One Ringy Dingy and Jeepers Creepers are two that have that on the back. 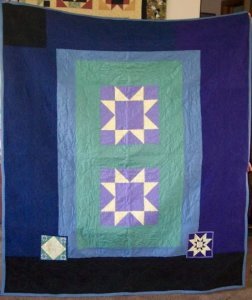 I think the 4-block quilt – Stars on a Tin Roof – does to. 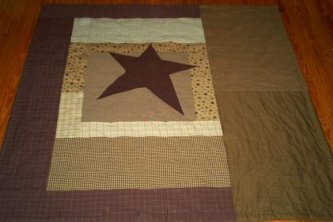 The Bundling Board has stars on the front so why not just have a large one appliquéd in the center of a pieced back, on the back? 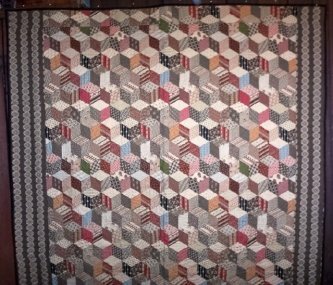 This is a quilt I made years ago, not in my pattern line, but has fun feed sacks on the back. 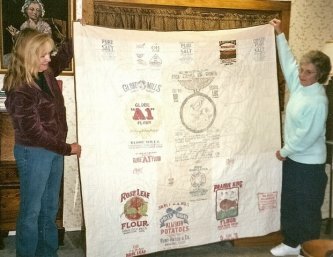 Charlene Higgin's, A Tisket A Tasket quilt back. Cheryle Harte's Slim Pickins back.....like me cheryle loves old feed sacks.